Aerial view over Bank Buildings following Tuesdays fire. Photo by Gregory Weeks. Photo by Gregory Weeks. Aerial view over Bank Buildings following Tuesdays fire.. 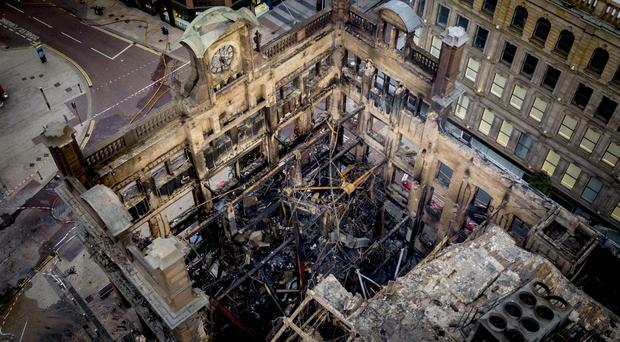 The cost of the fire that devastated Belfast's Bank Buildings could reach £75 million, it has been warned. And the ripple effect from loss of turnover could be £50m, according to one economist. 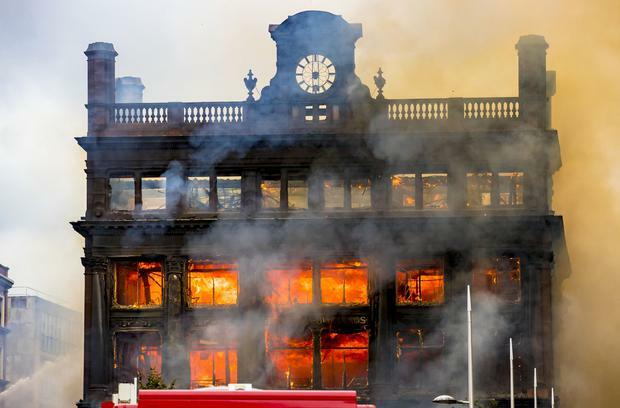 It comes amid growing fears of the long-term damage to Belfast's economy from Tuesday's blaze, which reduced the landmark building to a charred shell. Yesterday Primark's employees were told that all jobs were temporarily safe after the inferno. The 300-odd staff were asked to attend a meeting at the Europa Hotel to find out about their future with the company. A member of staff from the Union of Shop, Distributive and Allied Workers (USDAW) confirmed all employees would be paid for this week, but have not received certainty beyond that. Michaela Lafferty, area organiser for USDAW, said: "Our members are extremely distressed and concerned as they now enter a period of uncertainty. "I have been in regular contact with the company to offer them our full help and support." Bank Buildings was one of Belfast's busiest retail sites. Part of the city's main shopping district was yesterday cordoned off for a second day as firefighters continued their investigations. The Northern Ireland Fire and Rescue Service are attending an incident in Belfast city centre. Queen Street remained closed from Wellington Place to its junction with Castle Street, while Castle Street was closed from Queen Street to Royal Avenue. Yesterday two economists sounded warnings about the long-term cost. John Simpson said the estimated £75m bill included the cost of putting the blaze out and compensation. Displaced retail spending could top £50m over the next year, he indicated. Writing in today's Belfast Telegraph, he says: "Some of the shopping expenditure will be deflected to competitors but, in total, the loss of this Primark outlet will have wider negative effects as shopping in central Belfast loses some of its appeal." Meanwhile, Dr Esmond Birnie, senior economist at Ulster University, said the final bill will include the value of destroyed stock, the cost of restoration or building a replacement, and the knock-on effect on nearby businesses. "This could be significant given that Primark did act as a draw to visitors and footfall into that part of town," he said. "Very directly, businesses and streets will have limited access for at least a couple of days, so that will lead to lost activity and sales." Meanwhile, speaking after yesterday's meeting, Ms Lafferty said the option of redeploying staff is one of many being looked at by Primark. But if it comes to the redundancy stage, she added that USDAW would make sure its members are looked after. She said the meeting was "very constructive", and there was an appreciation that the company is only in a position to put in a short-term solution to Tuesday's catastrophe. She added: "We had the conversation about whether staff could be redeployed and all options are being looked at by the company for the good of their staff. That is very much their priority and USDAW's priority is looking after their staff going forward. "They naturally have questions over their future but they appreciate the uniqueness of the situation and that they can't have the answers today, because there are no answers today." Primark said: "Following yesterday's fire at our Bank Buildings store in Belfast, the welfare of our colleagues remains our most important concern and we are fully committed to supporting them during this difficult time." Primark staff who were forced to evacuate Bank Buildings without collecting their belongings were offered a helping hand to get back into their homes yesterday, thanks to a big-hearted footballer. 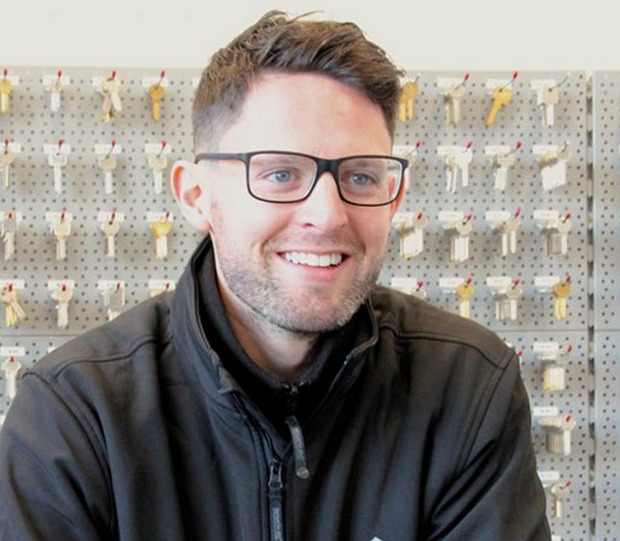 Owner of Pad Lock Security Ltd James Ferrin, who is also a central defender for Glentoran, posted a Twitter message offering to help staff who had lost their keys in the blaze regain entry to their homes for free, and to provide new keys. He told the Belfast Telegraph that he just wanted to offer a helping hand to the "devastated" staff. "It's bad enough losing your work, but not being able to get into their homes is causing these staff additional problems," he said. "If everyone puts in a bit of help, it will make it easier for them. I am working my way through social media - we have had hundreds of comments. "We can help people get in without having to break their doors. We have already helped a couple of people and expect more to contact us."